In 2013, the total of all economic costs per acre for growing corn in Illinois averaged $1,033 in the northern section, $966 in the central section for farmland with "high" soil ratings, $951 in the central section for farmland with "low" soil ratings, and $872 in the southern section. 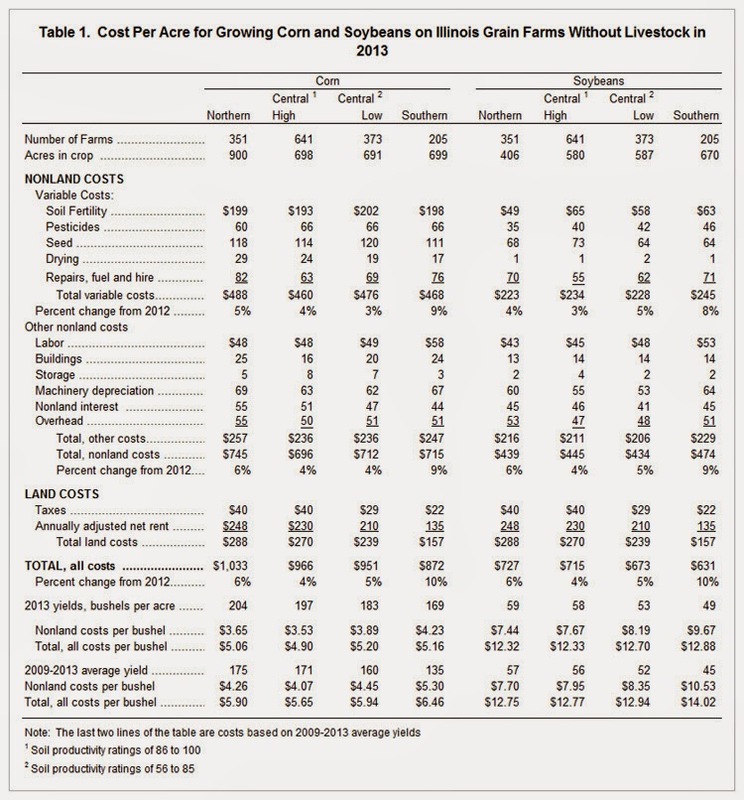 Soybean costs per acre were $727, $715, $673 and $631, respectively (see Table 1). Costs were lower in southern Illinois primarily because of lower land costs. The total of all economic costs per bushel in the different sections of the state ranged from $4.90 to $5.20 for corn and from $12.32 to $12.88 for soybeans. Variations in this cost were related to weather, yields, and land quality. These figures were obtained from farm business records kept by farmers enrolled in the Illinois Farm Business Farm Management Association. The samples included only farms which had no livestock and had more than 500 acres of productive and nearly level soils in each area of the state. Farms located in the 22 counties north and northwest of the Illinois River are included in the sample for northern Illinois. Farms from 36 counties below a line from about Mattoon to Alton are in the sample for southern Illinois. The remaining 44 counties make up the sample for central Illinois. The sample farms averaged 1,365 tillable acres in northern Illinois, 1,298 acres in the central section with high soil ratings, 1,328 acres in the central section with lower soil ratings, and 1,594 acres in southern Illinois. Costs per bushel of corn in 2013 as compared to 2012 were lower for all geographic areas of the state. Costs per bushel were lower due to higher yields. Costs per bushel were $1.76 lower in northern Illinois, $2.47 lower in central Illinois with the higher rated soils, $2.71 lower in central Illinois with the lower rated soils and $9.00 lower in southern Illinois. The average corn yield in 2013 was 61 bushels per acre higher than 2012 in northern Illinois, 68 to 71 bushels higher in central Illinois and 113 bushel per acre higher in southern Illinois. The 2013 average corn yield in the different geographical locations ranged from 23 to 34 bushels per acre higher than the five-year average from 2009 to 2013. Costs per acre were higher in all the different geographic regions in Illinois compared to 2012. Across the state total costs per acre to produce corn increased 4 to 10 percent. A number of costs increased, including pesticides, seed, drying, machinery depreciation and adjusted net rent. Soil fertility decreased in all areas of the state. Production costs per bushel of soybeans in 2013 decreased in all areas of the state as compared to 2012. Costs per bushel decreased mainly due to higher yields. Soybean yields were higher in every region when compared to the year before. Soybean yields ranged from 6 to 8 bushels per acre higher in 2013 as compared to 2012. Decreases in costs per bushel ranged from 94 cents in central Illinois with the lower rated soils to $1.43 in central Illinois with higher rated soils. Total costs per acre increased in all geographic regions of the state when compared to 2012. Costs increased $42 per acre in northern Illinois, $27 per acre in central Illinois with the higher rated soils, $32 per acre in central Illinois with the lower rated soils and $56 per acre in southern Illinois. Average soybean yields in the different areas ranged from 1 to 4 bushels per acre higher than the five-year average from 2009 to 2013. Total costs to produce corn for all combined areas of the state were $965 per acre. This figure increased 5 percent compared to the year before. Variable costs increased $20 per acre, or 4 percent, other nonland costs increased $14 per acre and land costs increased $14 per acre. 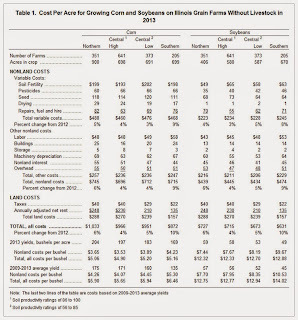 In 2013, cash costs accounted for 49 percent of the total cost of production for corn, other nonland costs were 25 percent, and land costs were 26 percent. The average corn yield for all combined areas of the state was 192 bushels per acre resulting in a total cost of production of $5.03 per bushel. The average corn yield was the highest in the last five years. The highest corn yield on record was 194 bushels per acre in 2008. Total costs per acre were the highest on record and total costs per bushel were the second highest. Total cost per acre to produce soybeans increased, from $661 per acre in 2012 to $697 per acre in 2013. Generally speaking, the same expenses that increased for corn also increased for soybeans. Variable costs accounted for 33 percent of the total cost of production for soybeans, other nonland costs 31 percent and land costs 36 percent. The average soybean yield for all combined areas of the state was 56 bushels per acre resulting in a total cost of production of $12.45 per bushel. The average soybean yield was tied for the highest on record. The cost per bushel to raise soybeans the last five years averaged $11.24 per bushel. The author would like to acknowledge that data used in this study comes from the local Farm Business Farm Management (FBFM) Associations across the State of Illinois. Without their cooperation, information as comprehensive and accurate as this would not be available for educational purposes. FBFM, which consists of 5,500 plus farmers and 60 professional field staff, is a not-for-profit organization available to all farm operators in Illinois. FBFM field staff provide on-farm counsel with computerized recordkeeping, farm financial management, business entity planning and income tax management. For more information, please contact the State FBFM Office located at the University of Illinois Department of Agricultural and Consumer Economics at 217-333-5511 or visit the FBFM website atwww.fbfm.org. ...for your 'Road Trip' List!